All our broadband plans are totally unlimited with no usage caps or download limits. They even come with up to 20GB extra every month exclusively for EE pay monthly mobile customers, and line rental is included in all our plans. Enjoy unlimited EE Fibre Broadband from just £27 a month + £15 set-up. All our broadband plans come with unlimited data with no usage caps or download limits. Unlike some broadband providers, we never slow you down - even at peak times. Enjoy superfast fibre broadband that’s up to 30 times faster than Standard Broadband. 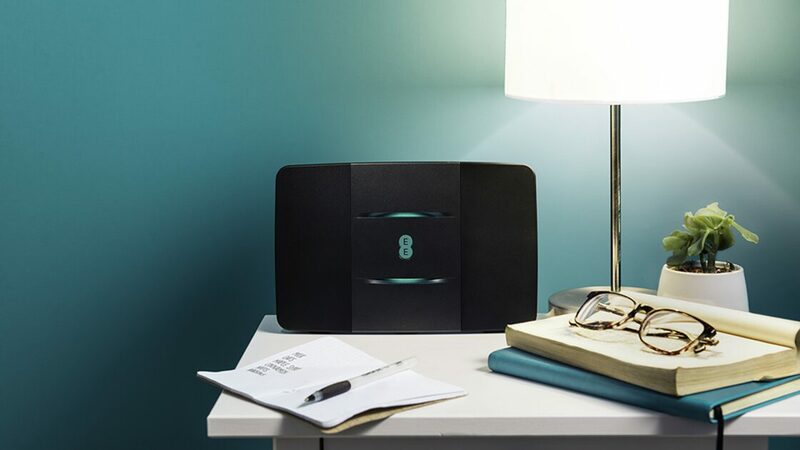 Our smartest, most powerful router yet. Designed to give you a stronger, more reliable WiFi signal. With EE TV you get over 70 free channels, access to loads of on demand entertainment and some of the best Pay TV when it suits you. With our range of calling add-ons you can call even more places, in the UK or abroad, from just £5 a month. Fast, reliable and what's more, it's easy to set-up. 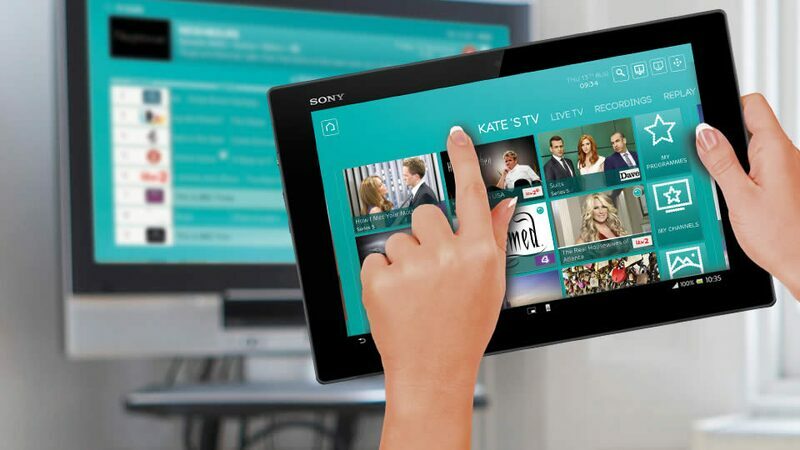 EE TV's technology is clever and easy to use. One phone call & we can set up your EE TV, broadband & landline in your new home - free of charge. Peace of mind with superfast support for EE TV, Broadband & Fibre. These introductory offers are available to customers joining EE broadband for the first time. £21 Standard Broadband: Join our Standard Broadband plan direct with EE and you'll pay £21 a month for 18 months,including £19 line rental, (18 month contract), plus a one-off set-up fee of £10. We'll apply a £10 discount to your bill each month. After 18 months we'll automatically remove the discount and charge you £32 a month -see our Price Guide for info at ee.co.uk/terms. Our standard broadband terms apply, check them out at ee.co.uk/terms. Prices may go up during your plan. Fibre offers For all our Fibre plans, how fast your Fibre Broadband will be will depend on a couple of things; firstly, how far you are from the nearest street cabinet that connects you to our network; and secondly, how many other people are using the network at the same time as you. £27 Fibre Only: Available for customers living in our fibre network area. Consumer plans only. Join a Fibre plan direct from EE and you'll pay £27 a month for 18 months,including £19 line rental (18 month contract). We'll apply a £9 discount to your bill each month. After 18 months we'll automatically remove the discount and charge you £37 a month -see our price guide for info ee.co.uk/terms. Our fibre broadband terms apply, check them out at ee.co.uk/terms. Prices may go up during your plan. £31 Fibre Plus: Only available for customers living in our fibre network area. Consumer plans only. Join a Fibre Plus plan direct from EE and you'll pay £31 a month for 18 months,including £19 line rental (18 month contract). We'll apply a £10discount to your bill each month. After 18 months we'll automatically remove the discount and charge you £42 a month -see our price guide for 3 info ee.co.uk/terms. Our fibre broadband terms apply, check them out at ee.co.uk/terms. Prices may go up during your plan. £40 Fibre Max 1: Our Fibre Max broadband plans utilise a new technology known as “G.fast”, so to join one of these plans, you’ll need to live in an area which is enabled for G.fast. Consumer plans only. Join a Fibre Max 1 plan direct from EE and you'll pay £40 a month for 18 months,including £19 line rental (18 month contract). We'll apply a £8 discount to your bill each month. After 18 months we'll automatically remove the discount and charge you £49 a month -see our price guide for info ee.co.uk/terms. Our fibre broadband terms apply, check them out at ee.co.uk/terms. Prices may go up during your plan. £47 Fibre Max 2 Our Fibre Max broadband plans utilise a new technology known as “G.fast”, so to join one of these plans, you’ll need to live in an area which is enabled for G.fast. Consumer plans only.Join a Fibre Max 2 plan direct from EE and you'll pay £47 a month for 18 months,including £19 line rental (18 month contract). We'll apply a £6 discount to your bill each month. After 18 months we'll automatically remove the discount and charge you £54 a month -see our price guide for info ee.co.uk/terms. Our fibre broadband terms apply, check them out at ee.co.uk/terms. Prices may go up during your plan. Fibre Max 2 (Average speed of 300Mbps) is up to 30 times faster than UK standard broadband: EE Fibre Max 2 Broadband average download speed of 300Mbps compared with the UK average download speed for standard broadband (ADSL2+ over 10Mbps, excluding fibre) of 9.8Mbps from the Ofcom report on UK home broadband performance, November 2016 (published April 2017). Fibre Max 1 (Average speed of 145Mbps) is up to 14 times faster than UK standard broadband: EE Fibre Max 1 Broadband average download speed of 145Mbps compared with the UK average download speed for standard broadband (ADSL2+ over 10Mbps, excluding fibre) of 9.8Mbps from the Ofcom report on UK home broadband performance, November 2016 (published April 2017). Average speeds of 10Mb/s, 36Mb/s, 67Mb/s, 145Mb/s and 300Mb/s based on speed available to at least 50% of customers at peak time (8-10pm). Speeds vary by location. Check your speed at https://shop.ee.co.uk/broadband. Data Boost: 5GB available to new and existing Pay Monthly phone customers who sign up to a Standard, Fibre, Fibre Plus Home Broadband or 4GEE Home plan. Data allowance boosted by 5GB. Boost added to mobile only and cannot be added to 4GEE Home device. Data allowance boosted by 20GB if you have a Pay Monthly phone plan and Fibre Max Broadband.Not available with 30 day SIM Only plans or non-lead sharer plans. You’ll lose the data boost if you cancel your Home Broadband plan or Pay Monthly phone plan, or switch to a 30 day SIM Only plan. In order to retain your data boost when you upgrade or change your Pay Monthly phone plan, your Home Broadband must still be active, and you must be moving to or remaining on a Pay Monthly phone plan. It can take up to 30 days from broadband account start date for your Data Boost to be applied. Data fair use policy may apply when roaming. One boost per household. Subject to availability. We reserve the right to withdraw or vary the boost at any time. 5GB Data Boost Worth £12.99 a month: Based on the cost of 1x 5GB add-on that lasts up to a month for a pay monthly customer. 20GB Data Boost Worth £39.98 a month: Based on the cost of 2x 10GB add-ons that last up to a month for a pay monthly customer. 10GB add-ons cost £19.99 each. EETV: Residential, private and domestic use only. Not to be used for commercial purposes or public broadcast. Set-top box provided on free hire and it’s your responsibility to keep it in good condition. You’ll need to return the box at the end of the agreement, otherwise we'll charge you and lock certain services. Roof top digital aerial required. Free to air television channels only unless you pay extra for content. Free television channels are subject to coverage, see www.freeview.co.uk/availability. You’ll need a valid TV licence. Subject to availability. For the full terms ee.co.uk/eetvterms. EETV with standard broadband: Only available for customers signing up to a new broadband plan. 18 month minimum term applies. Prices subject to change. Monthly charges assume online billing. Subject to credit check. £32.50 a month including the usual monthly line rental of £19 a month for 18 months. £39 a month from month 19. Calls charged at standard call rates, see our Price Guide. £50 charge applies if new phone line required. Speed depends on the distance to the nearest street cabinet that connects you to our network and number of users. Subject to availability. Our standard broadband terms apply, see ee.co.uk/terms. EETV with Fibre Broadband: Only available for customers signing up to a new broadband plan. Prices subject to change. Only available for customers living in our fibre network area. 18 month minimum term applies. Subject to credit check. Monthly charges assume online billing. Consumer plans only. £35 a month for 18 months. £44 a month from month 19. See our Price Guide for info at ee.co.uk/homepricing. Offer includes monthly line rental which is £19 a month. Calls charged at standard call rates, see our Price Guide. £50 charge applies if new phone line required. Speed depends on the distance to the nearest street cabinet that connects you to our network and number of users. Subject to availability. Our fibre broadband terms apply, see ee.co.uk/terms. EETV with Fibre Plus Broadband: Only available for customers signing up to a new broadband plan. Prices subject to change. Only available for customers living in our fibre network area. 18 month minimum term applies. Subject to credit check. Monthly charges assume online billing. Consumer plans only. £39 a month for 18 months. £49 a month from month 19. See our Price Guide for info at ee.co.uk/homepricing. Offer includes monthly line rental which is £19 a month. Calls charged at standard call rates, see our Price Guide. £50 charge applies if new phone line required. Speed depends on the distance to the nearest street cabinet that connects you to our network and number of users. Subject to availability. Our fibre broadband terms apply, see ee.co.uk/terms. £48 Fibre Max 1 & EE TV: Our Fibre Max broadband plans utilise a new technology known as “G.fast”, so to join one of these plans, you’ll need to live in an area which is enabled for G.fast. Consumer plans only.Join a Fibre Max 1 and EE TV plan direct from EE and you'll only pay £48 a month for 18 months,including £19 line rental (18 month contract). We'll apply a £8 discount to your bill each month. After 18 months we'll automatically remove the discount and charge you £56 a month -see our price guide for info ee.co.uk/terms. Our fibre broadband terms apply, check them out at ee.co.uk/terms. Prices may go up during your plan. £53 Fibre Max 2 & EE TV: Our Fibre Max broadband plans utilise a new technology known as “G.fast”, so to join one of these plans, you’ll need to live in an area which is enabled for G.fast. Consumer plans only. Join a Fibre Max 2 and EE TV plan direct from EE and you'll only pay £53 a month for 18 months,including £19 line rental (18 month contract). We'll apply a £8 discount to your bill each month. After 18 months we'll automatically remove the discount and charge you £62 a month -see our price guide for info ee.co.uk/terms. Our fibre broadband terms apply, check them out at ee.co.uk/terms. Prices may go up during your plan. What does it take to switch to EE? It couldn't be easier to join us. Simply enter your landline number and/or postcode in our Availability Checker to check the speed available to your home, choose your package online, enter your details and we'll take care of the rest. Will I be able to keep my existing phone number? You can usually keep your phone number. If you provide us with your existing phone number when you're completing your order online, we'll let you know. How long will it take for my router to arrive? Your new router and Quick Start Guide will arrive by post before your Broadband switches to EE. And you won't need to wait in for a delivery as our Bright Box and Smart Hub routers have been designed to fit through most letterboxes. You will receive your easy to follow set up guides with our award winning Bright Box router. What if I need a new phone line? If you need a new phone line, simply tick the box requesting an appointment with an engineer when making your online order, and we'll be in touch as soon as this has been arranged for you. A standard installation charge of £50 will be added to your first bill. Our technical support experts are ready to answer any question you may have no matter how technical or trivial they are, that's if you can't find the answers on our comprehensive online help section first. Is the broadband data allowance really unlimited? Yes. Unlimited means unlimited. Customers on any unlimited Fibre or Broadband plan have an unlimited data allowance. This means you can browse, download, stream videos and play games online without worrying about usage caps or extra costs. For more information check our Traffic Management Policy.